The c1860s 9-tube lens set shown mounted on the Carte de Visite Wet Plate Camera (which can be set up for 1 to 4-lenses) is a rare find. The camera body is notched for septums and masks that can accommodate 4 or 9-lens outfits. This Gem set is comprised of nine matched Darlot No.2 lens "tubes" (petzval design) mounted on a brass plate. The wood shadow box has a Scovill Manufacturing Co, NY label. 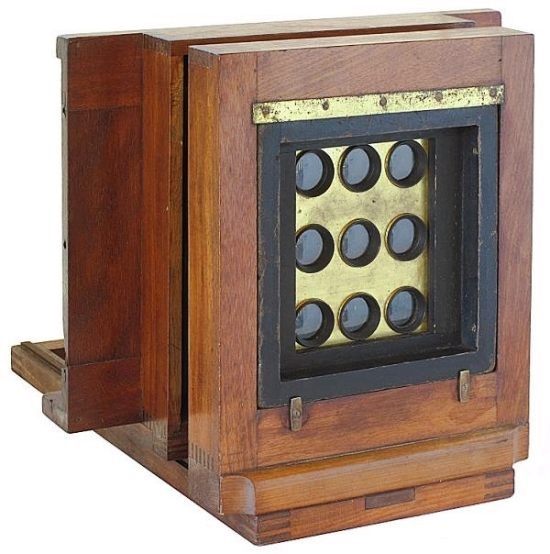 Note: The Scovill Manufacturing name was in use from 1849 - 1889.
plate camera with nine Darlot No.2 lenses.